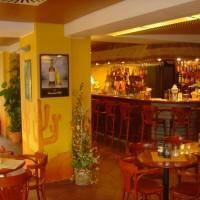 This 3-star tourist-class hotel is located in the suburbs in Prague 9 area to the west from the city centre. Modern and comfortable accommodation, good value and with a good range of leisure and sport facilities. Although situated outside the city centre, the heart of the city can be reached within 30-min using Prague's efficient public transport system. The nearest metro 'Palmovka' is 10-15min away and the metro goes directly to the centre ('Namesti Republiky') in 10 minutes. Alternatively, there is a tram stop 5-min from the hotel that has direct 15-min connections (tram 8) to the historical centre ('Namesti Republiky'). The hotel is located close to Sazka Arena (2 tram stops away), a large venue for concerts and sport events. The hotel is near a major rail intersection and there may be some noise at times from passing trains. There is a large leisure centre (also used by general public) including large fitness centre and weight training, sauna, whirlpool, massages, sunbed, squash and tennis courts and a bowling alley. There is an extra charge for the use of leisure facilities. Rooms are small to medium in size. They are furnished in a home-like atmosphere with simple wooden furniture. They are modern, comfortable and in good condition. The hotel restaurant serves Czech and international cuisine. Lobby bar serves Mexican cuisine. Continental buffet breakfast included. Please note there are 70 steps leading to the hotel and therefore not suitable for those with mobility problems.